The liquid that comes off of a defrosting chicken provides a safe harbor for Campylobacter, according to a new study. Chicken “juice” from a defrosted bird turns a surface into a protein-rich environment in which Campylobacter can form a protective biofilm, reported a study from the Institute of Food Research. This biofilm helps bacteria attach to things and survive tough conditions. The researchers used strains of Campylobacter jejuni, the form of the bacteria that causes 90 percent of Campylobacter foodborne illness infections, for the study. While all Campylobacter usually has trouble living outside its natural environment, a chicken’s gut, chicken juice turns a formerly unfriendly surface into one that attracts Camplyobacter biofilm, found the researchers. “This film…makes it much easier for the Campylobacter bacteria to attach to the surface, and it provides them with an additional rich food source,” said Helen Brown, a PhD student at IFR, funded by the Biotechnology and Biological Sciences Research Council. Brown’s studentship is co-funded by Campden BRI, in a statement. While other types of molecules from animals, such as bovine serum proteins or milk, either slow or inhibit biofilm formation, the liquid expelled by chicken enhances it, according to the paper. “This study highlights the importance of thorough cleaning of food preparation surfaces to limit the potential of bacteria to form biofilms,” said Brown. Researchers designed the experiment to imitate conditions in an industrial kitchen, putting chicken juice on stainless steel surfaces. While the presence of chicken broth increased Campylobacter attachment and growth, the concentration of chicken broth didn’t make a difference. More concentrated broth did not help Campylobacter biofilm to attach and grow. Chicken broth also evened the playing field for different strains of Campylobacter. Strains that have no flagella, or tail, usually attach to surfaces and form biofilms more easily, but chicken broth made it easier for strains without flagella to attach to surfaces too, according to the study. The researchers said their findings point to a need for more research on animal juices and bacteria. “This highlights the need for future studies to not only investigate the link between chicken or pork soil and surface conditioning but also assess the effect of other meat exudates on biofilm formation,” reads the paper’s conclusion. The study was published ahead of print Sept. 5 in Applied and Environmental Microbiology. 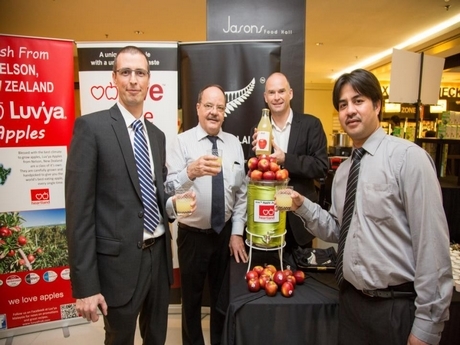 The Heartland Group, a consortium of apple growers in New Zealand have created the world’s first commercially viable single strain apple juice made from its signature eve™ apples. 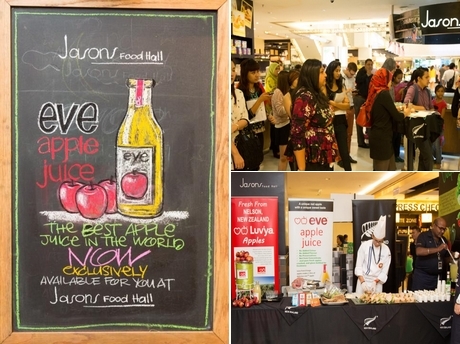 eve™ Juice made its global debut in Malaysia today at Jason’s Food Hall, Bangsar Shopping Complex. The pure, no-preservatives, no-added sugar, cloudy apple juice which is available in one-litre glass carafes is exclusive to the GCH Retail Group in Malaysia namely Jasons Food Hall, Mercato and Cold Storage. Single strain apple juice is superior as it allows the natural flavour to remain largely unchanged and preserves the taste and the aroma of the apple. In contrast, multiple-variety apple juices usually require sugar and the use of other additives to stabilise the taste. eve™ Apples, discovered and cultivated only in New Zealand, is a popular apple worldwide and is naturally heavy in juice. The natural sweetness of the apple also means there’s no sugar needed in the bottled juice, making it a healthier choice especially for children. The natural tanginess and tartness of eve™ apples makes it the ideal apple for juicing. Brendon Osborn, General Manager of Heartland Fruit gave an insightful talk on apples grown in New Zealand and the various uses of the many varieties of apples. Clearly a passionate fruit marketer, Mr Osborn explained that apples are the ‘core’ of what they do at Heartland Fruit. eve™ apples are grown and made using a method called Applecraft™, which is a proven method of growing superior quality apples. “Because we love apples, over the years we have fine-tuned a rigorous quality process which ensures that every block of our orchard produces consistent good quality apples. We call this quality process Applecraft™ which acts as standard guideline on how we grow, harvest, pack and ship apples. It is a way we ensure the right things we do to grow apples, gets passed on from generation to generation,” said Mr Osborn. “With great apples comes great juice. eve™ Juice is a pure, fresh beautiful cloudy juice with no added sugar, and in it you can actually taste a bottle-full of eve™ apples!,” Mr Osborn added. 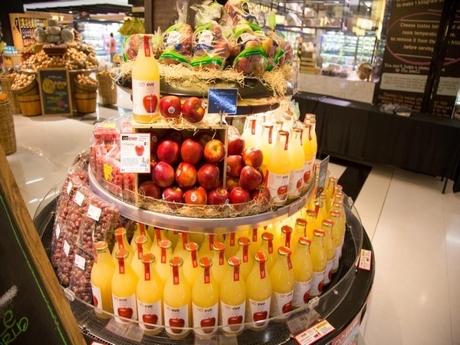 The Heartland Fruit group is made up of four passionate apple orchadists based in Nelson, New Zealand. Together they produce a range of apples called Luv’ya™ apples. The Luv’ya™ apples range include old favourites such as Royal Gala, and Braeburn. Heartland are also growers of proprietary varieties such as the sweet, tart and popular Pink Lady™, sweet, crunchy and flavourful Ambrosia™ and the juicy and firm Smitten™ which is another variety from New Zealand’s apple breeding programme. Heartland owns the growing rights for the bright red and juicy crisp eve™ and the strong and sweet Divine™. 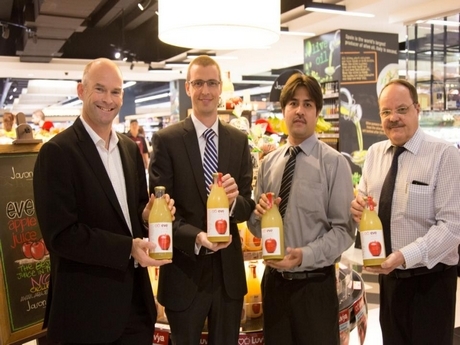 According to Mr Osborn, the company chose to launch the juice in Malaysia first, as the market had shown a demand for good quality pure apple juice amongst the discerning consumers according to its exclusive retail partner in Malaysia GCH Retail Malaysia. “We pride ourselves in delighting our customers with new arrivals in gourmet gastronomy from all over the world. Having the world launch of eve™ Juice at Jason’s Food Hall is indeed an honour and an endorsement of our mutual commitment to top quality products,” said Mie Shareen, Store Manager of Jason’s Food Hall. Each bottle contains the juice of eight apples and will be available at an introductory price at RM19.99 at Jasons Food Hall, Mercato and Cold Storage. As part of the launch, Chef Roizz from Berjaya University College of Hospitality gave an interesting food demonstration using eve™ apples, eve™ Juice and a range of Luv’ya apples from Heartland Fruit. He showed how to make delicious, mouth-watering Waldorf Salad, Apple Crumble and a smooth apple mocktail using eve™ Juice. Russia has upped the ante again with a ban on Ukrainian juice imports. TriVita Inc. of Scottsdale, AZ, will refund $ 3.5 million to consumers for marketing its cactus juice as a cure-all for pain, inflammation, and respiratory and skin problems. All those health claims are unfounded, according to a unanimous Federal Trade Commission. The marketers of the cactus-based fruit drink have agreed to the refunds to settle FTC charges that they deceived consumers with unsupported claims that their drink, Nopalea, would treat a variety of health problems. TriVita markets 32-ounce bottles of the “prickly pear” fruit drink, derived from the Nopal cactus, for up to $ 39.99, plus shipping and handling. The defendants’ infomercials featuring celebrity endorser and former supermodel Cheryl Tiegs market Nopalea as an “anti-inflammatory wellness drink” that relieves pain, reduces and relieves joint and muscle swelling, improves breathing and alleviates respiratory problems, and relieves skin conditions. The infomercials also feature testimonials by satisfied consumers, who, according to the FTC complaint, are actually paid employees of the defendants. Failing to disclose that supposedly ordinary consumer endorsers were, in fact, TriVita salespeople who received commissions for selling the defendants’ products. Besides TriVita, the complaint names as defendants marketing firm Ellison Media Company, and Michael R. and Susan R. Ellison, who control both companies. Under the proposed settlement order, the defendants are barred from making the health claims alleged in the complaint when marketing Nopalea or any food, drug, or dietary supplement without randomized, double-blind, placebo-controlled human clinical tests conducted by qualified researchers; making any health claims without competent and reliable scientific evidence; misrepresenting that health benefits are clinically proven when they are not, and failing to disclose any material connection between endorsers of their products and themselves. Supplements do not require approval from FDA before they go on the market. FTC says that consumers should carefully evaluate advertising for products that claim to cure diseases. The widespread expectation among Florida growers is that at least one Florida juice processor will shut down before the beginning of the 2014-15 citrus season in the fall. Most frequently mentioned is the Indian town plant operated by Louis Dreyfus Citrus Inc., a subsidiary of the French agriculture and energy company. Also mentioned less frequently is the Lake Wales plant operated by Citrosuco North America Inc., the U.S. subsidiary of Brazilian processor Citrovita Agro Industrial Ltd., that country’s largest juice processor. Conventional wisdom in the Florida citrus industry has a spotty record for accuracy, but the logic is straightforward enough: Under attack by the devastating bacterial disease citrus greening, Florida citrus production has fallen by more than half and grapefruit production by nearly two-thirds over the last decade, and more declines are projected for the next 10 years. There’s simply not enough fruit to support juice production at Florida’s existing 19 processing plants. In the five-year period through the 2003-04 citrus season, the last one unaffected by greening or hurricanes, Florida orange growers produced an average 226.3 million boxes and 45.1 million boxes of grapefruit. The recently completed season saw orange production drop to 104.3 million boxes and grapefruit to 15.6 million. Annually, 95 percent of Florida oranges and more than 60 percent of grapefruit get processed to juice. Consolidation among juice processors seems not unreasonable given the shrinkage in the state’s packinghouse just this year. In April, the Kennedy family auctioned off its 47-year-old Vero Beach packinghouse business, United Indian River Packers Inc., along with nearly 2,000 acres of land, including 850 citrus grove acres, ending nearly a century of the family’s Florida citrus enterprise. In June, Greene River Packing Inc. and Leroy Smith Inc., announced a merger of their Vero Beach packinghouses. The new company, Greene-Smith Packing LLC, will operate out of the Greene River packinghouse. Figures on citrus processing capacity in Florida are not available, but Hugh Thompson, president of Cutrale Citrus Juices U.S.A. Inc. in Auburndale, a subsidiary of another Brazilian processor, estimated existing capacity at 220 million boxes, or more than twice needed to process the 2013-14 crop. Thompson declined to comment on whether Cutrale and other Florida plants can continue to operate profitably at 50 percent capacity. Other citrus officials are divided on that question. A processing plant has certain fixed costs, such as building and machine maintenance, quality control and other management costs, that vary little whether it runs 1,000 or 1 million boxes of fruit, Roe said. As juice production declines, those fixed costs get spread over a smaller number of gallons, which inevitably gets passed on to the consumer in higher retail prices, he added. The economics of making orange juice differs from manufacturing widgets, said Tom Spreen, professor emeritus of agricultural economics at the University of Florida in Gainesville, and the Florida processing industry doesn’t operate by the same economic rules. For one thing, Spreen said, processors and fresh fruit packinghouses operate only about half a year, the length of the harvesting season. Moreover, one of a processing plant’s biggest fixed costs is leasing and running extractors that squeeze juice from the fruit, he added. Because the machines are leased, plants can downsize more readily as citrus production falls. There’s already been a substantial downsizing of processors and packinghouses in response to market forces that pre-date greening, such as the 37 percent decline in U.S. retail OJ sales that began in 2000-01, Spreen said. The market also has moved away from frozen concentrated orange juice and reconstituted OJ from concentrate. According to the Florida Department of Citrus, the number of citrus processors declined by half in the early part of the last decade from 42 companies in 2000-2001 to 21 in 2006-2007. Most of the companies that closed during the last 13 years produced mostly frozen concentrate, which has declined more rapidly in sales compared to not-from-concentrate (NFC) orange juice, Spreen said. Of the remaining producers, the “Big Seven” processors are involved mainly in NFC production, he said. They are Florida’s Natural; Tropicana Products Inc. in Bradenton, the largest U.S. processor; Cutrale (which processes for Minute Maid); CitroSuco (which processes for Tropicana); Dreyfus; Peace River Citrus Products Inc. in Arcadia; and Southern Gardens Citrus Processing Corp. in Clewiston. Behr agreed that even significantly lower orange production in future seasons doesn’t necessarily spell impending doom for processors of NFC OJ, Florida’s premium citrus product. The Florida’s Natural brand is an entirely NFC line. At current sales levels, about 75 million boxes of oranges will be processed to meet the U.S. demand for NFC orange juice, Behr said. As the state’s orange crop declines, frozen concentrate processors will feel the pinch before NFC companies do. In June, Keenes, IL-based Frey Farms introduced a new, high-end bottled watermelon juice branded “Tsamma” (pronounced s-amm-a). The juice is manufactured in Lakeland, FL, 30 minutes from Frey’s largest watermelon farm. 12-ounce bottles of Tsamma watermelon juice. Hilary Martin, director of business development, told The Produce News that Tsamma is the name of a hardy melon grown in southern Africa’s Kalahari Desert, which is thought to be the ancestral mother variety of all melons. The new beverage is 100 percent juice, has no added sugar and is made from seeded watermelons. Martin added that it is 88 percent watermelon juice, with white grape and pomegranate juice, as well as a touch of malic acid, making up the remaining 12 percent. On Oct. 26, Frey Farms will give Tsamma to participants of the Marine Corps Marathon, held in the nation’s capital. Participants will receive Tsamma watermelon juice as they cross the finish line. “Frey Farms is one of the top watermelon shippers in the United States, providing watermelons to the country’s largest retailers, including Walmart,” according to the release. Frey Farms produces 7,000 acres of watermelons and is one of the nation’s largest producers of pumpkins. Improved productivity should bring up Brazilian citrus volume this year, particularly for juice. Recent action by the U. S. Food and Drug Administration’s (FDA) may smooth the path for food manufacturers to continue to declare sweeteners derived from cane syrup (such as sugar) as “Evaporated Cane Juice” (ECJ) on food labels, at least for the foreseeable future. Last month, FDA announced that it was reopening comments for 60 days on its 2009 draft guidance for declaring ECJ as an ingredient. The announcement states that FDA reopened comments to obtain more information on ECJ and to better understand the difference between ECJ and other sweeteners. FDA’s announcement comes amid controversies over the use of ECJ in place of sugar on food labels. In Northern California, for instance, class-action plaintiffs sued food manufacturers, alleging that ECJ is another name for sugar. And, while food companies may want to use the term ECJ rather than sugar to make their products seem healthier, FDA regulations require food labels to reflect common or usual names of ingredients. So far, the most important issue in the ECJ lawsuits has been the relationship between FDA’s draft guidance and primary jurisdiction. Primary jurisdiction allows courts to dismiss a case without prejudice, e.g., without declaring one side a winner, when the issue is within the special competence of an administrative agency and the agency is taking steps to address an issue. Put differently, a court can dismiss a case on primary jurisdiction grounds and defer to an agency working on the issue. Prior to FDA reopening the commenting period, it was unclear whether courts should dismiss the ECJ cases on primary jurisdiction. On one hand, class-action plaintiffs argued that FDA has already resolved the ECJ labeling issue because it has clearly and continually held that sweeteners derived from cane syrup should not be labeled as ECJ. On the other hand, industry argued that a 2009 draft guidance, which is not binding on industry, is not a final resolution of the issue. But not all district court judges are following Judge Illston’s reasoning, according to Arnold (Arnie) I. Friede, a food and drug law attorney and a former associate chief counsel in FDA’s Chief Counsel’s Office. “Given the divergence of views by different district court judges on whether ECJ cases should be dismissed on primary jurisdiction grounds, it seems reasonable to believe that the matter will be up before the U.S. Court of Appeals for the Ninth Circuit in the not-too-distant future,” Friede said. FDA reopened the draft guidance for 60 days, but it is unclear what the agency’s actions on the ECJ issue will be after comments close. “The agency expects to issue final guidance, although I cannot predict a date at this time,” said Arthur Whitmore with FDA’s Office of Foods and Veterinary Medicine. Given FDA’s long to-do list, some are skeptical of whether the agency will take action to resolve the ECJ issue anytime soon. “As a practical matter, and now that it has reopened the comment period on the draft ECJ guidance, it is probable that FDA will not get to this for a very long time, if ever, particularly given other competing priorities in the food arena,” Friede said. So courts are dismissing ECJ cases on primary jurisdiction grounds, thanks to the reopened commenting period. Yet it seems that FDA will not likely resolve the ECJ issue on its own, at least for now.